Our ultimate desire at m.l.c. is to create for our customers the ultimate outdoor living space in a way that expresses their individuality along with our expertise and knowledge in the industry. We firmly believe that together we can provide our clients with an outdoor environment that was once only dreamed of. We are a full service swimming pool and landscape construction company. We serve the Orange County, Southwest Los Angeles County and Coastal San Diego County areas. We do complete turnkey yard projects as well as water vessel only projects. Stoneface Inc. specializes in custom sculpted concrete projects ranging from residential rock pools, spas and entertainment centers to aquariums, zoos, theme parks and retaining walls. The owner, Mark Allen, is extremely hands on and personally designs and creatively directs each and every project. With 35 years of experience in the industry, Stoneface can turn your dream project into a reality! Premier Pools Orange County is proud to offer an exceptional swimming pool building experience to their discerning clients. Our team consists of experienced orange county pool builders and young designers who bring innovation and customization to each project. We are not only swimming pool contractors, but outdoor living specialists who can design and build your complete backyard living area. Using the swimming pools as a focal point, we can integrate your amenities and landscaping into a fluid design that complements your home and surroundings. We specialize in swimming pools that require extra engineering, such as a beautiful vanishing edge pool overlooking the Pacific Ocean. We are fortunate that Orange County has some of the most beautiful backdrops for our swimming pools in the country. From small lots to expansive grounds, we assure you that your Orange County swimming pool will be customized to your needs and desires, have the finest construction and be a source of entertainment for you and your family for years to come. Gentili Custom Pools specializes in custom swimming pool and spa and outdoor living design/build. Some of our most popular projects include rock pools with beach entries, waterfalls, grotto caves, slides, and swim-up bars. Our style centers around a blend of traditional and mediterranean pools and back yards - stacked ledger stone, infinity edges, and fire bowls are some of our most prominent features. We enjoy bringing outdoor spaces to life using outdoor covers and living spaces with fireplaces, outdoor kitchens, BBQ's, bars, and entertainment areas. Some of our larger projects have included implementing sports courts, retaining walls, garden walls, full landscaping, landscape lighting, and putting greens. Every yard and project is unique unto themselves and there is no "one size fits all." During our co-creative consultation profess, we offer free Budget Analysis' based on your needs and wants and always strive to give our clients realistic and accurate budget expectations. We can itemize the Budget Analysis and also give you a Low and a High price range, depending on final design and choice of options. Through our process, we can eliminate the frustration of over designing a project by making feature choices within your ideal price point. We then provide a detailed scaled drawing to show all the features and with exact costs. We started in 1975 servicing and repairing swimming pools. After seeing many mistakes made by other builders who did not have a vested interest in the maintenance aspect of their projects, it became clear to us that there was a need not only to make a beautiful pool, but also to be able to easily service and maintain it after it was built. So in 1987 we started up the construction side of our business and have been building pools ever since. We also added Landscaping to our services by obtaining a Landscape License to compliment our Swimming Pool License. Now, a homeowner need only deal with one company to complete the full package. From design to completion, we can design and build anything that can be put in a backyard. We Design & Build Quality Custom Pools in North Orange County. We get the job done as per plans, on time and on budget. Our average pool build takes about 4-6 weeks. Your satisfaction is our #1 priority. Teserra has been designing, building and servicing outdoor masterpieces for almost 30 years. Southern California isn’t just a geographically defined region, it’s a way of life. And perhaps no swimming pool design company has done more to enhance that enviable lifestyle than Teserra Outdoors, the best swimming pool contractor from Orange County to Palm Springs. From that refreshing midnight dip on a warm summer night to that soothing soak on a sun-drenched afternoon in February, it’s a way of life worth celebrating. Landscape design and build company specializing in hardscape, softscape, water features and outdoor living. Orange County's Preferred Landscape Contractor For Almost 30 Years! Teserra has been designing, building and servicing outdoor masterpieces for almost 30 years. Alderete Pools, Inc. provides a full range of professional services and designs to meet your family needs. We carefully work with the architect and client to ensure that each pool and yard meets all of the requirements in professional and cohesive manner. Ray, Bob, and Loretta Alderete have built a reputation that is second to none in the swimming pool/spa industry. Each pool and spa is personally supervised by them to ensure the utmost in quality and craftsmanship. Custom tailored luxurious designs with award winning results have been our specialty for 30 years. Whether the pool/spa is simple or extravagant, Alderete Pools, Inc. can provide the professional craftsmanship and customer service that is needed. You owe it to yourself to buy the very best. Let Alderete Pools, Inc. turn your backyard into the "best room of your house". We have been in the swimming pool industry for more than 13 years and in general construction for more than 18 years, here in California and formerly in France. Our philosophy is that a pool isn’t just another structural addition to your home; it’s a lifestyle enhancement. Hear the soft sounds of a waterfall or enjoy the excitement of children splashing around and you’ll know that there’s more to a Monaco Luxury pools than just architecture and construction. Our goal isn’t to build the most pools but to build the best, and not to build the most expensive pools, but to give our clients the best value. 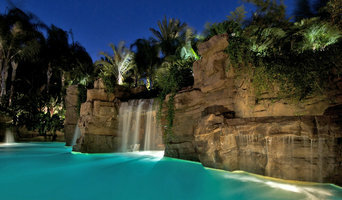 We treat our customer exactly the we way we would like to be treated, and this is a priority for Monaco Luxury pools. We take pride in providing great customer service with high quality pool construction. We also build waterfalls and various other water features such as; swim up bars, custom rock formation, fire pits, fire places, BBQ’s, pool house, open lattice, solid roof structure, outdoor room kitchen, all kind of decking, masonry, custom landscaping, accent lighting and more. You dream it we build it! What better place to spend quality time with your family and friends than in your very own private backyard resort? Your decision to choose Monaco Luxury Pools is one you are going to love for years to come! Whether you are looking for a decadent display of outdoor luxury living or a simple park-like garden – we will deliver your vision to you. We employ experienced artisan craftsmen that are trained to have an eye for detail and take pride in their work. We use only top quality materials that are specially selected for your individual project. Our goal is to become your landscaper for life! We are passionate and committed to every landscaping project and focused on exceeding our client’s expectations. We specialize in the quality construction of landscape installation. For over 50 years, Swan Pools has been creating outdoor family environments that are built to last a lifetime. Incorporated in 1954, Swan Pools has one of the longest and most dependable track records in the pool and spa industry. Not many companies can claim to have built 50,000 pools in California. The value to the consumer is the immeasurable confidence that our customers have in not only the construction process but also the ongoing future relationship that exists as long as they own their pool. Through the generations, lifestyles have changed and so has today's swimming pool. To stay on the cutting edge of this changing technology Swan Pools is constantly developing new design techniques and installation procedures that must pass specific quality control standards. This ensures that each new product or material that a consumer may want will stand the test of time. We build pools, not just for today, but for tomorrow. What makes Swan Pools unique is our belief in the value of specialization of skills. You will experience this starting with your initial meeting with an Aquatic Designer, continuing throughout purchasing, financing, engineering, and the professionalism of our construction staff. Everyone you will meet is an expert in what they do, including specialized customer service. This is essential with today's modern features, which incorporates pool automation that can be controlled from your mobile phone or computer, fiber optically lit water features, and advanced water purification systems. Contact us for your next pool or spa project! Sun Country Pools began with a vision – a vision to provide outstanding quality at a great price and to lead the swimming pool industry with innovative ideas and the highest quality of customer service. We are family owned and operated. Sun Country Pools has been designing and building the finest custom pools and spas in Orange County California for over twenty five years. Our mission at Pacific Paradise Pools is to help you enjoy your pool, your family, and create lasting memories. Family owned and operated since 1984, we specialize in the construction of new pools, spas, water features, and major pool renovations to include: spa additions, sculptured rock conversions, rock slides, swim up bars, grotto's and all the outdoor entertainment areas your imagination can dream up. Pacific Paradise Pools has developed a reputation for backyard design excellence, a systematic approach to care and attention to all the construction details, a solid base of referrals from loyal, satisfied customers through consistent customer service, and a fair and honest business strategy. You can also visit us at our newest addition to Pacific Paradise Pool and Spa Center. DRC Pools, the Best builder in Orange County for Pools, Masonry & Landscaping Based in Yorba Linda, California, DRC Pools has offered superior outdoor living area design and construction services to Orange County residents for more than 13 years. Finding our beginnings in masonry as DR Construction more than 40 years ago, we have grown from a masonry company into a custom pool, spa, masonry, and landscape design company. 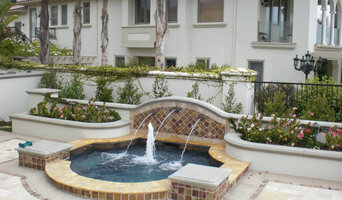 DRC Pools is the premiere custom pool, masonry, and landscape design contractor in Orange County. 90% of our work is completed in-house, allowing us to price ourselves competitively and helps us complete our work in a time-efficient manner. Our mission is to provide quality service and complete customer satisfaction in everything we do, whether it’s high-quality landscaping, masonry, pools, or anything else. DRC Pools promises to provide a unique design that will correspond to your lifestyle. Our designers work closely with you to ensure the desired result. We guarantee outstanding craftsmanship, personally inspecting every aspect of the job, and paying careful attention to even the smallest detail. Please view our photo gallery to see how our work illustrates out incomparable standards. See the quality of work DRC Pools provides and what distinguishes us from our competitors. What exactly do Newport Beach pool builders do? If you are planning for a new pool in Newport Beach, CA, a swimming pool builder will analyze your outdoor space and your aesthetic wishes to determine an appropriate design for your yard, installing it once the plan is developed and approved. Once installed, some pool companies in Newport Beach, CA can handle the necessary cleanings, water testing, renovations and equipment replacement or repairs for your pool or spa. If not, many can also suggest Newport Beach, CA swimming pool contractors or maintenance services to help with upkeep or repairs down the road. Here are some related professionals and vendors to complement the work of swimming pool builders: Garden & Landscape Supplies, Landscape Architects & Landscape Designers, General Contractors, Landscape Contractors, Solar Energy Contractors. Before hiring a swimming pool construction company to create your new Newport Beach, CA pool, determine how you'll be using it. Will it be for fun or for lap exercise? Will the primary users be children, adults or a mix of the two? Knowing the use can help you find Newport Beach pool builders who shares your aesthetic. Once you find swimming pool builders in Newport Beach, CA who share your style, research is critical. Review customer references and comments, collect at least three to four estimates to compare, meet with potential Newport Beach pool designers and builders in person and ensure that they are California certified service professionals and licensed with the registrar of contractors before making any final decisions. In addition, get a sense whether they plan to complete the pool installation and be done with it, or whether they seem interested in building a long-term relationship with you. Be wary of the former: it's likely a reflection on the level of quality of the pool construction they do. Find a Newport Beach pool contractor or designer on Houzz. Narrow your search in the Professionals section of the website to pool builders in Newport Beach, CA. You can also look through Newport Beach, CA photos by style to find a pool or spa you like, then contact the local pool company who designed it.